The average yearly change in mass, in centimeters of water, during 2003-2010, for all the world’s glaciers and ice caps (excluding Greenland & Antarctica). 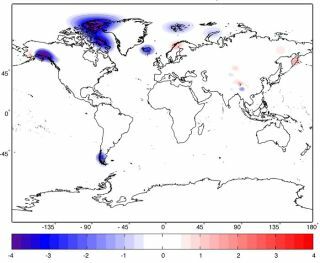 Glaciated regions with large ice loss rates stand out clearly. The Aletsch Glacier in Switzerland. Glaciers and ice caps outside of Antarctica and Greenland melted enough to raise sea levels by 0.016 inches (0.41 millimeters) per year between 2003 and 2010, according to an analysis of satellite data. This story was provided by LiveScience.com, a sister site to SPACE.com. You can follow LiveScience senior writer Wynne Parry on Twitter @Wynne_Parry. Follow LiveScience for the latest in science news and discoveries on Twitter @livescience and on Facebook.